BIAFRA-NIGERIA WORLD (WASHINGTON POST) -- More than half a century after it gained independence from Britain, Nigeria is in crisis. Africa’s most populous country is caught in a struggle between maintaining national unity and ceding to secessionist desires from those demanding an independent state in the southeastern region of the country. As tensions and violence between the government and separatists approach a breaking point, a third, equally risky solution has arisen: overhaul the political infrastructure altogether and decentralize governmental power. One thing is clear: Nigeria in its current form is not working for an overwhelming majority of its citizens and needs to be reimagined, renegotiated and redesigned. Change is the country’s only hope. The southeastern region of Nigeria is populated mostly by the Igbo ethnic group, which makes up about 18 percent of the country’s overall population. The Igbos already attempted secession once in 1967 when their leaders declared the Republic of Biafra, leading to a bloody civil war that cost over 1 million mostly Igbo lives. 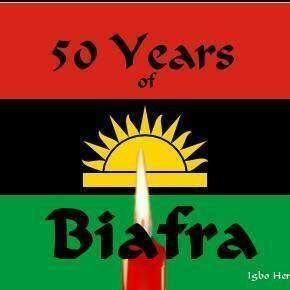 Today, there is no state in Nigeria called Biafra. The short-lived republic was not recognized by most countries, including Nigeria, and it was reintegrated into the country at the end of the civil war in 1970. Since then, secessionist groups, including the Indigenous People of Biafra, or IPOB, have called for a referendum on a proposed Biafran state, with the most recent demand this year marking the 50th anniversary of the civil war. Tensions have particularly escalated with the 2015 election of President Muhammadu Buhari, whose government has launched a deadly crackdown on separatists. Buhari has said that he will favor constituencies in the North over those in the Southeast because the North polledoverwhelmingly in his favor during presidential elections, while the Southeast showed comparatively little support. This has left Igbos feeling further marginalized. “There is pain and hardship everywhere,” Nnamdi Kanu, the leader of IPOB, said in May.“What we’re fighting [for] is not self-determination for the sake of it. It’s because Nigeria is not functioning and can never function.” Kanu has not been seen or heard from in public since soldiers stormed his residence in mid-September. IPOB supporters allege he was killed or kidnapped by the Nigerian army, which in turn denies any knowledge of his whereabouts. Today, Nigeria is still grappling with many of the same questions the leaders of the country’s independence movement optimistically attempted — and ultimately failed — to answer. Who are Nigerians? How do we make Nigeria work? In order to achieve lasting change, Nigerians need answers. There was a paradox in Nigeria’s 1950s independence movement: while anti-colonialist, it needed to sell the idea of Nigeria as one state, itself a colonial construct after the British drew borders and declared it one territory. Borders that never existed before forced different autonomous groups and people together — the largely Muslim but ethnically diverse North was joined with the largely Christian but also ethnically diverse South. To succeed in the difficult task of convincing a diverse population that it should work together, Nnamdi Azikiwe, who would become the country’s first president, proffered a seductive vision: Nigeria was the promise of participation in global greatness, only achievable through unity. “The various communities or nationalities inhabiting this country have great traditions and a rich heritage of culture which, if pooled together, can make Nigeria great and enable her to take her rightful place among the family of nations,” Azikiwe said in a 1958 speech. But it has not been a lasting vision. Nigeria currently ranks a lowly 152 out of 188 countries in the United Nations’ Human Development Index. More than 60 percent of Nigerians live in poverty, and the state fails to provide basic amenities, including electricity and running water. Frustration with Nigeria’s failures has fueled IPOB’s popularity. Many Nigerians are now calling for a redesign, a devolution, a comprehensive political-administrative restructuring of the country. But will devolution work? In theory, Nigeria’s governance structure is modeled on the United States federal system. But in practice, it is a heavily centralized state, with power and resources concentrated in the hands of the president. The states are weak and dependent on oil revenue distributed by the central government. Devolution would require state-level political leaders to work harder. Some say devolution won’t solve the problem of corruption in Nigerian governance. Others say that many of Nigeria’s states are not economically viable and would likely end up returning, hat in hand, to the federal government, which would be forced to bail them out or risk collapse. These are all valid points, and no one can truly predict the results of a decentralized Nigeria. Regardless, Nigeria as currently designed is failing. While separatists demand an independent state, moderates demand restructuring and the president insists Nigerians must stick together, everyone agrees that something needs to give; the status quo has become unbearable for too many Nigerians. A debate about restructuring is a starting point. Yes, it will be messy, as all of Nigeria’s diverse communities will want their voices heard and ideas implemented. But it is necessary for moderates to take the reins in order to finally place Nigeria on a plausible path to achieving the collective success Nigerians have been promised since independence. Otherwise, what really is the point of staying together?